If she was from a small family, leaving them to marry me would deprive her parents of a much needed pair of hands, and her father would want a high price to compensate for the family’s loss, maybe more than I could afford to pay. I guess you can tell my brain was going about a hundred miles an hour. Even though I was known as a quiet and easy-going man, my prayers that the Lord would let me have her were urgent and intense. I quickly discovered her name was Miriam, or Mary to you. She was from the tribe of Judah, like me. Then I learned that she had no brothers at all and no older sisters. This meant that she was first in line to be married and that she was her father’s principal heir, being his firstborn child. It also meant that according to our law she could only marry a man from the tribe of Judah. Let me explain. Back in the time of Moses, before the Land was originally divided among the tribes and families, the Lord warned my people they could never sell it to anyone. He said it was all His and they were just tenants. (Lev. 25:23) This was to make sure that no tribe could ever lose its inheritance. Each family’s allotment of land had to be passed down from father to son, and as part of the Jubilee Year observance all land had to be returned to it’s rightful owners. At that time there was a man named Zelophehad of the tribe of Manasseh who had only daughters. One day the leaders of his tribe came to Moses complaining that they had been told to give Zelophehad’s land to his daughters, since he had no sons. What would happen if the daughters married outside the tribe and the land passed into their husbands’ families’ estates? Would the Tribe of Manasseh lose part of its inheritance at the Jubilee? When Moses inquired of the Lord, He said that in cases where there were no sons in a family, daughters could inherit land from their fathers but had to marry men from within their own tribe. That way the tribal allotments would remain intact. (Numbers 36:1-12) Since Mary had no brothers, she had to marry someone from the tribe of Judah, someone like me. Later, this would become a very important issue. I was not only from the Tribe of Judah, but a descendant of King David, in the royal line of succession to the throne through King Solomon. So although a poor carpenter from Nazareth, I was technically a Prince of Israel, in line to be King. But God had cursed the royal bloodline, as it’s called, at the time of King Jehoiachin (also called Jeconiah) 600 years earlier. He was so evil that in anger God declared that no descendant of his would ever rule in Israel again. (Jeremiah 22:28-30) So even though God had promised King David that only direct descendants of his son Solomon could be kings in Israel, the royal line was now cursed. Being descended from Solomon, I was part of that line so neither I, nor any blood descendant of mine, could ever be king. Mary was also from the Tribe of Judah, and a direct descendant of King David as well, but through Nathan, Solomon’s brother. Nathan’s bloodline was not cursed. If a son of Mary’s could somehow prove he was also in the line of succession, he could be King. But if he was biologically related to any man in the royal bloodline, a requirement for succession, he’d inherit the curse. It was a real catch 22. Of course God, Who knows the end from the beginning, wasn’t breaking His promise to King David by cursing the royal line. He knew how He was going to solve the problem. At the proper time, He would simply arrange to have a virgin from the House of David be wed to a man in the royal line of succession and then have her conceive a male child without her husband’s participation. Giving Mary’s parents only daughters was step one in accomplishing this. She couldn’t marry outside the Tribe of Judah. Making me fall in love with her was step two, and having our Son conceived of the Holy Spirit completed the process. So now you know what the Bible means when it says our son was of “the house and lineage of David.” (Luke 2:4) Through His mother He was descended from King David, a member of his “house.” Since He was legally my son, He inherited royal lineage, but because we weren’t biologically related he sidestepped its curse. This made our son the only man in Israel qualified to be King of the Jews, then or since. Our God is the Master of the loophole. So the virgin birth was required to perfect our son’s claim to the Throne of David in fulfillment of one of Gabriel’s promises to Mary. It was also required to make him the Son of God in fulfillment of the other. (Luke 1:30-33) And it was required to fulfill Isaiah’s prophecy to King Ahaz. (Isaiah 7:14) But I’m getting ahead of myself. As soon as I arrived at their house and introduced myself to them, Mary’s parents guessed why I’d come. As they invited me to sit down at the family table, they called her to join us. Mary got out four cups and wine but didn’t pour any for herself. She sat listening intently as I spoke with her father, telling him (and her) why I thought I would be a good husband for her. Since she and I had never officially met, this was the first time I had ever been this close to her. She was the most beautiful girl I’d ever seen, and I couldn’t keep my eyes off her. And as it was with every Jewish girl, this was how she learned about the man who would become her husband. After a proper amount of negotiating, we agreed on the bride price and all eyes turned to Mary. She now had about 30 seconds to decide the course of her life. If she filled her cup and drank from it, we were betrothed. If she turned her empty cup upside down I would leave and never come back. It was her choice. Those few seconds seemed like hours, and I’m sure the pounding of my heart was visible through my robe as I waited, not daring to breathe. Finally, she filled her cup and took a sip. No man in all the world has ever been happier than I was at that moment. Alas, that feeling would not last long. A short time later Mary came to me and explained that she was pregnant. She told me all the angel Gabriel had said to her, that her child was supernaturally conceived and destined to become the King of Israel. It was quite a story, believe me. Please understand, in our culture even engaged couples could never be alone together. There was no dating as there is today, and only a few short chaperoned conversations during the entire year-long betrothal. I didn’t know how she got pregnant, but I knew that it didn’t involve me! I was devastated by her confession, the anger and betrayal any man would feel raging through my mind. I had every right to bring her before the priests and charge her with adultery, a crime punishable by death! But I loved her, so I suggested we get quietly divorced so she could go away. It was the only way a betrothal could only be ended and it would save her the public disgrace she would otherwise have to endure, even if she wasn’t brought before the priests. It was the most painful conversation I had ever endured, so to give us both time to recover she left town for a long visit with her cousin Elizabeth. (Elizabeth, though much older was also pregnant with a son, who would be called John the Baptist.) One night while she was away an angel of the Lord appeared to me in a dream, confirming what Mary had said. Based on that dream, as soon as Mary returned I told her I would not abandon her, but would take her as my wife and raise her child as my own. We were married immediately and I moved her into the house I had already built for us. Finally, just as it was about time for Mary to deliver, we had to pack up and head for Bethlehem, where all descendants of King David had to be registered for the census the Roman Governor required. It took us four days to get there, with Mary riding on our small donkey while I walked alongside. I can only imagine how uncomfortable she must have been during that ride. After what seemed like an eternity we arrived in Bethlehem only to find the city’s one inn all sold out. And as if that wasn’t bad enough, Mary went into labor! I had to find a place fast. I inquired at every house in town about using the guest room all Jewish families were required to keep available for visiting pilgrims, but they were all promised to others. Just when I thought we had exhausted every possibility, the innkeeper took pity on us and offered his stable where we could at least get out of the cold night air. 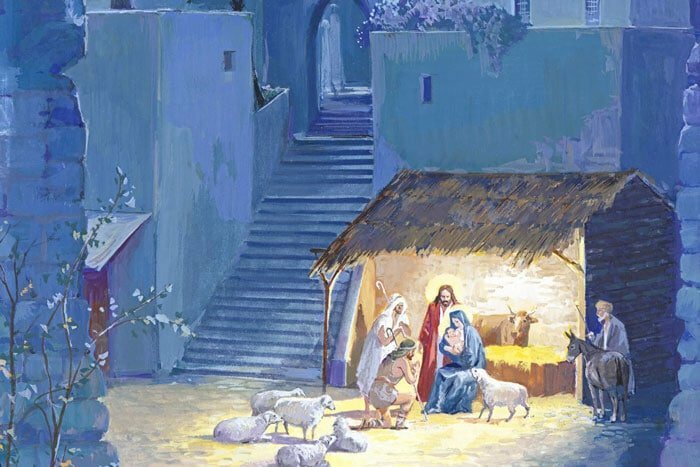 Making my beautiful pregnant wife a bed of straw, and helping in every way I could, I watched the miracle of life unfold in the most unique way ever as she gave birth to the Son of God. Typically in Israel the birth of a first-born son was an event accompanied by great celebration. Fathers hired musicians to go singing and dancing through the streets proclaiming the good news. But we were almost 70 miles from home and I was way too poor to afford musicians, so our son’s real Father saw to this for us. Opening the Heavens, He had the angels sing and proclaim the ultimate Good News! next post: Is He Enough?